Oral chemotherapy is one way chemotherapy is given and usually comes in tablet form (pills or capsules) but may be a liquid. Usually oral chemotherapy tablets are encased in a protective coating that is broken down in the stomach. The chemotherapy drug is then released and absorbed by the lining of the stomach and intestines. 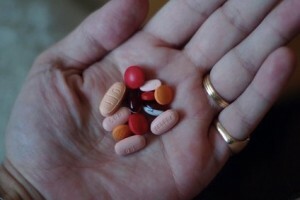 Not all chemotherapy drugs can come in tablet form as some medicines can be destroyed by stomach acid and some can’t be absorbed into the patient’s body through the stomach lining or intestines. If the medicine is not absorbed, then it will simply pass into stools or urine and won’t work. Some medications are too harsh to be taken orally as they damage the stomach lining. An example of an oral chemotherapy drug sometimes used for pancreatic cancer is capecitabine, which is used in the GemCap combination. For more information on this chemotherapy combination ask your doctor. This is the most common method of delivering chemotherapy as most drugs are easily absorbed into the bloodstream. Intravenous administration allows the drug to rapidly enter the body’s circulation which carries it to the tumour through the blood stream. Doses can be given which last from a few minutes to a few hours, depending on the cancer and the drug used. Continuous infusions can even be given over a few days or weeks at a time. Sometimes portable infusion pumps are used which allows medication to be given in a slow continuous way. A small, thin tube or cannula may be inserted into a vein in the forearm or the back of the hand. The cannula may be uncomfortable, or even painful, but this soon eases. Once inserted, the cannula is securely taped to fix it in place and the drugs are given through a drip. This is a temporary device which is removed after each individual treatment. These allow your medication to be delivered continuously at a slow rate. Portable infusion pumps are pressure pumps, which means that they don’t need a battery. This type of pump is quite small. You can carry it in a small bag (which you will be given in hospital) or through your belt. There are also small battery operated pumps known as ambulatory pumps. There are different types of these and your nurse will show you how to operate the pump you need to use. You may need to have your continuous pressure or battery operated pump changed regularly. This can either be done in hospital or by a home chemotherapy or district nurse. A port-a-cath, also known as an implantable port or a subcutaneous port, is often used for patients who need frequent or continuous administration of chemotherapy. Sometimes chemotherapy drugs can, over time, damage smaller veins of the body and be painful. To make the treatment more comfortable and convenient, a port-a-cath system can be used. A port-a-cath is made up of two parts: a port and a catheter. The catheter is a thin, soft, plastic hollow tube that is put into a vein in your chest or arm and has an opening (port) just under the skin. It allows medicines to be given into the vein, or blood to be taken from the vein. The port is about 2.5-4 cm (1-1.5 inches) in diameter and has one chamber which is covered by a plastic membrane. It is through this membrane that a special needle known as a Huber needle will be inserted to deliver the medication or to take blood. A port-a-cath is usually inserted under local anaesthetic but occasionally a general anaesthetic will be used. The procedure, which takes less than an hour, is performed in an operating theatre or an area called the vascular radiology unit, and x-ray machines and ultrasound machines will be used to obtain the correct position of the portocath. 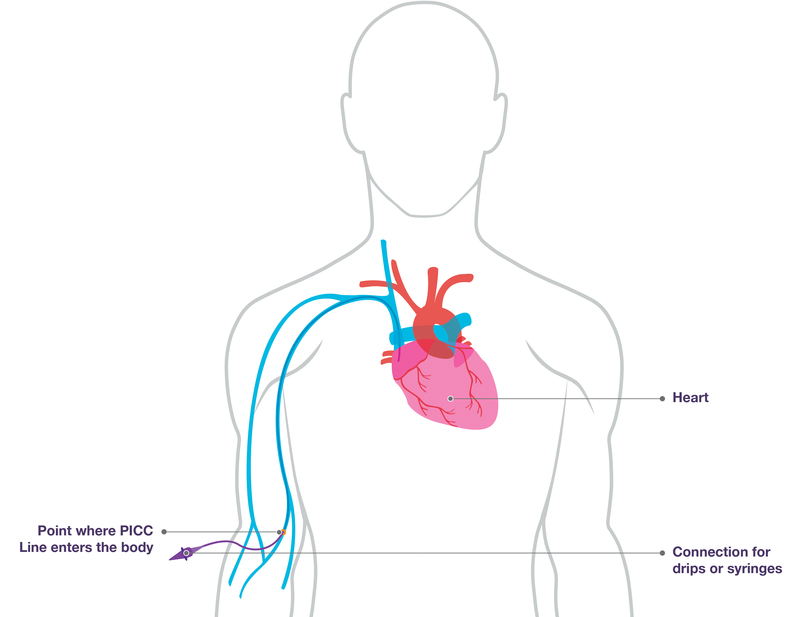 The catheter or tube is usually inserted under the skin of your chest, or in your arm. The tip of the catheter lies in a large vein just above your heart. 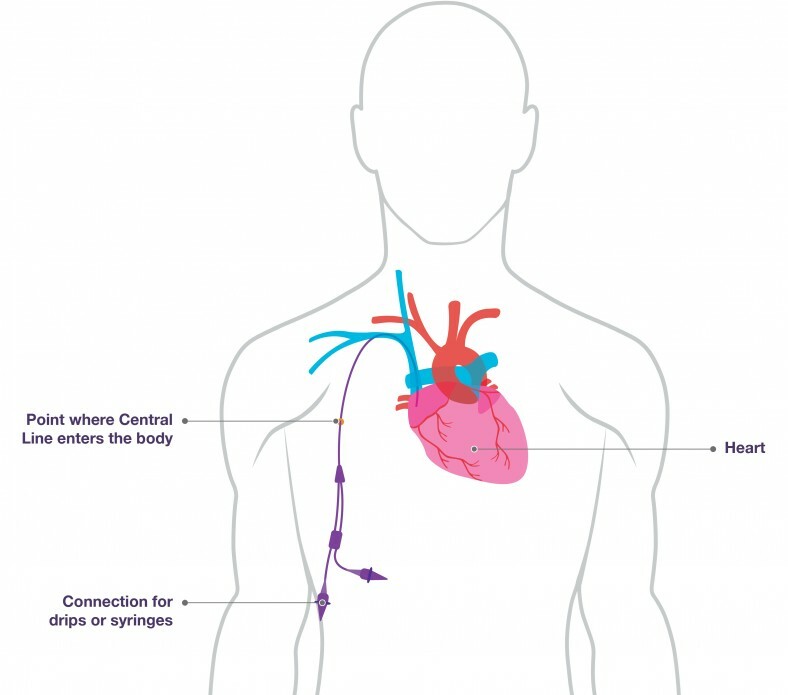 The other end of the catheter connects with the port, which sits under the skin on your upper chest or arm. You will not normally be able to see the port as it is underneath your skin, but you will be able to feel it like a small bump. You may feel a little discomfort at the site of insertion after the anaesthetic wears off, and there may be some swelling and tenderness around the port for a few days. You may shower 24 hours after the port- a-cath has been inserted and take a bath after 2 weeks. Once the wound has healed, no dressing will be required. the procedure once you have recovered from the sedation. It is recommended that you do not perform any strenuous exercises or do any heavy lifting for 2 weeks following the procedure. A port-a-cath can be left in place for many months and even years (although this is rarely the case). Rarely the catheter can get blocked with clots and tissue growth and sometimes can become infected. If you do have an infection, you’ll be given antibiotics. If these don’t clear it, or if the infection is serious, the port may have to be removed. Central lines, known by trade names, Hickman® or Groshong® Lines, are placed through the skin in the middle of the chest. They are pushed through the subcutaneous tissue (the layer of tissue between the skin and the muscle) and inserted into the superior vena cava (the vein that carries blood to the heart from the upper body). These catheters can have several lumens (entrances) to allow blood samples to be taken or drugs given at the same time. Each lumen has a special cap at the end of the line outside the body. A drip line can be attached to these lumens. Central lines are usually inserted under a local anaesthetic in an out- patients department. In most cases it only takes a few minutes to put in. Once in place, the central line is stitched and taped firmly to your chest to prevent it from being pulled out of your vein. The stitches will be removed about 10-14 days afterwards depending on the hospital practice. Central lines can stay in place for months or even years (although this is rarely the case). Central lines prevent the need to have a cannula put into your veins each time you receive treatment. This may be very helpful if it is difficult to get needles into your veins, or if the walls of your veins have been hardened by previous chemotherapy treatment. Central lines can also be used with portable infusion pumps which allow medication to be given at a slow continuous rate. A PICC line (Peripherally Inserted Central Catheter) involves the placement of a thin flexible tube into a vein in your arm. The tube is threaded through the vein until one end of the tube sits close to your heart. Once in place, the PICC line may be stitched in and taped firmly to your arm. A special x-ray called fluoroscopy confirms that the PICC line is in the right place. The stitches will remain in as they prevent the line from being pulled out of your vein. It can also be held in place with a transparent dressing. This procedure is usually done under local anaesthetic by a specially trained nurse or doctor. PICC lines are temporary and can remain in place from a few weeks to a few months. As with a central line, you will not need a cannula put in each time you have your chemotherapy. Blood can also be taken through the line for testing. Blockages are caused by blood clotting where the line enters your vein. Depending on the type of line you have, it may need to be flushed with saline containing heparin (a drug to prevent clotting) once a week to prevent blockages. If you have a temperature over 38oC (105oF), notice swelling, redness, darkening and soreness of the skin around the central line you may have an infection in the line. You will need to contact your doctor or nurse straight away and if you have an infection, you will need antibiotics to clear it up. This is particularly important while you are having chemotherapy because changes in your immune system mean you can be at greater risk of an infection becoming serious. It is generally quite hard for the tube to fall out as your skin will grow around it. If it does fall out, do not panic but do contact the hospital straight away. Your medical team will give you details of who to contact in these circumstances. If your tube has fallen out, put a clean dressing over the area to keep it covered before you go into the hospital. Do not throw the line away as your doctor or nurse will need to check it to make sure it is complete and that no parts have been left inside your skin. On very rare occasions, the line can snap or puncture. Contact the hospital immediately if this happens and clamp the tube by tying a knot above the hole. Do not throw away the rest of the line, but take it with you to the hospital.